The Rigg Design Prize 2018 exhibition. Last Thursday evening a packed room in the foyer of the NGV’s Ian Potter Centre in Melbourne’s CBD was in silence as the winner of the 2018 Rigg Design Prize was announced by international judge Shashi Caan, CEO of the International Federation of Interior Architects/Designers (IFI). 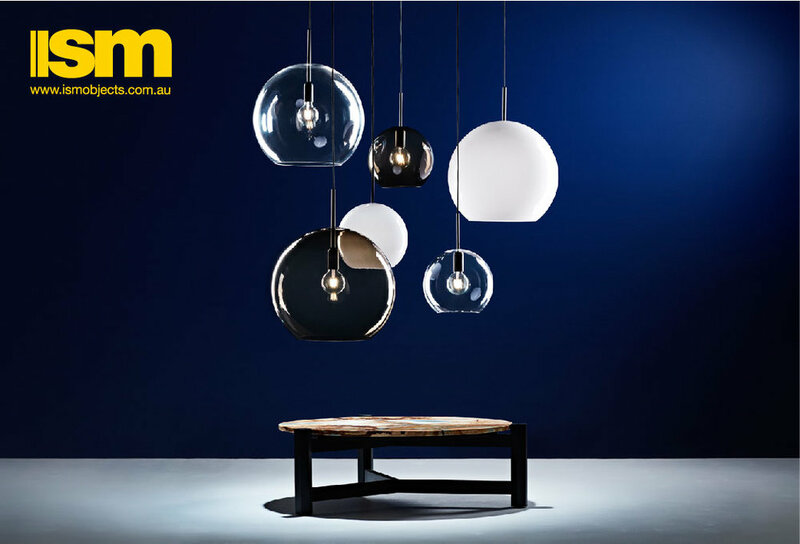 The winner (as most of Design daily’s Australian readership will by now know) was Melbourne based interior design studio Hecker Guthrie, led by Paul Hecker and Hamish Guthrie. Their parred back concept involving a multitude of oak tables flipped every-which-way to approximate all furniture items found in a domestic interior from storage to chairs and beds was combined with terracotta ceramics in 2-D caricatures of everyday items like taps and tooth brush holders by Bruce Rowe of Anchor ceramics. The scheme involved just two colours and two materials and was at complete odds with the highly decorative approach taken by nearly every single one of the other nine shortlisted studios (with perhaps the exception of Richards Stanisich’s concept). The exterior of the installation by the winner of the Rigg Prize 2018 - Hecker Guthrie. 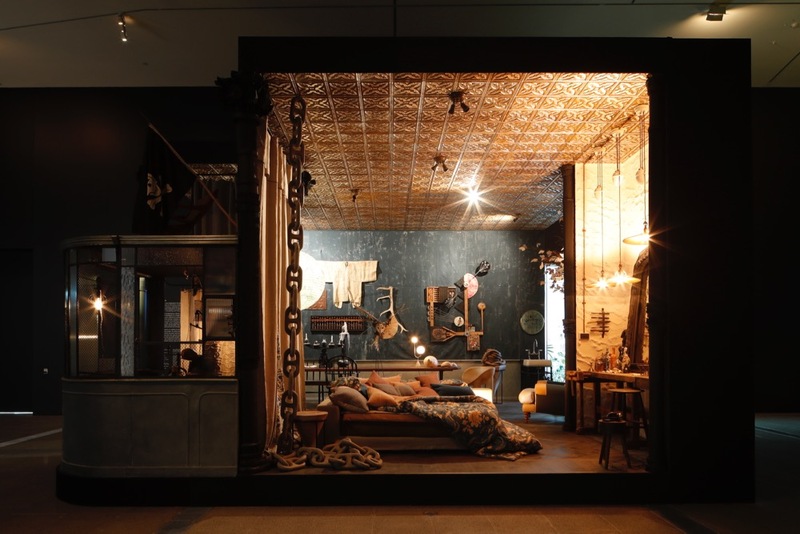 $30,000 is awarded to the winner of the triennial Rigg Prize and this time around the award that celebrates the best in Australian design has, for the first time, an interior design focus. Recent winners of the Rigg Prize have included industrial designer Adam Goodrum in 2015 and jeweler / metalsmith Marian Hosking in 2012. 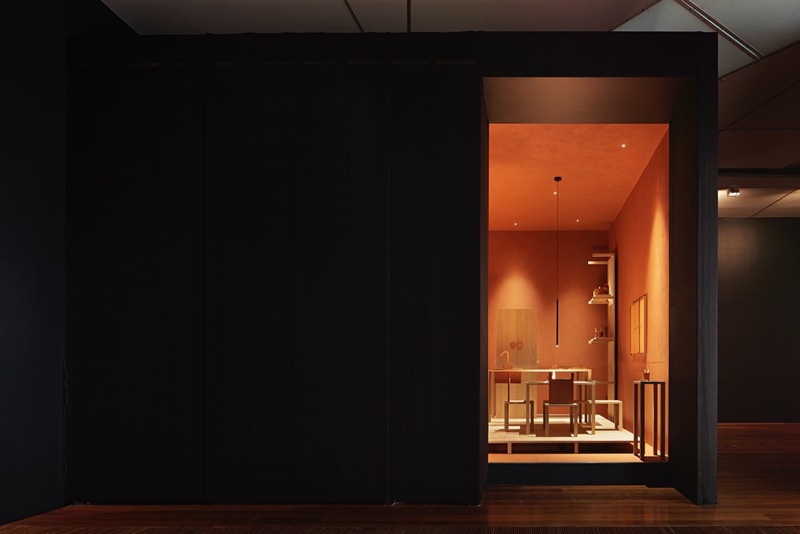 The Rigg Prize 2018 exhibition features bespoke, purpose-built interior rooms by the ten shortlisted Australian interior designers: Amber Road, Arent & Pyke, Danielle Brustman, Flack Studio, David Hicks, Hecker Guthrie, Martyn Thompson Studio, Richards Stanisich, Scott Weston Architecture Design and The Society Inc by Sibella Court. The exhibition runs through to late February 2019. To make it easier to visualise the journey through the exhibition, the images follow the exhibition route - with the exception of the winners who, of course, have been elevated from the last installation to prize position. The interior of the Hecker Guthrie installation, totally constructed from tables in all heights and sizes but with just one leg dimension (a magical 47 x 47mm) and everyday accessories in solid terracotta clay by Bruce Rowe. For their winning entry, Heck Guthrie enlisted the help of Andrew Lowe of Lowe Furniture to make the plethora of tables required and Bruce Rowe of Anchor Ceramics for all the terracotta pieces. Additional lighting was by Davide Groppi. Martyn Thompson Studio’s moody fabric-filled environment with subtle moving lighting with vintage and custom made items that spoke of individualism and a love of craft. New York based Martin Thompson Studio showed an interior where upholstery was the key decoration, from jacquard wall hangings, and room dividers, armchairs, lampshades, throws and ottomans all covered in this centuries old complex woven material. Thompson injects his photographic talents into everything he does to create a deeply personal, seemingly haphazard space. 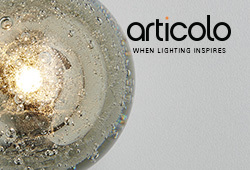 Light, sound and textures combine in a bohemian world that is relaxed and genuine. The Richards Stanisich installation with its myriad of glossy wall tiles and ancient looking ‘kitchen’. The other side was a complete surprise, revealing acres of ruched linen for a bed. Sydney based studio Richards Stanisich are better know as the interior designers of successful interior architecture firm SJB. After sixteen years of creating some incredible interiors as part of the SJB group, Jonathan Richards and Kirsten Stanisich have gone out on their own - although they will continue to have close associations with SJB. 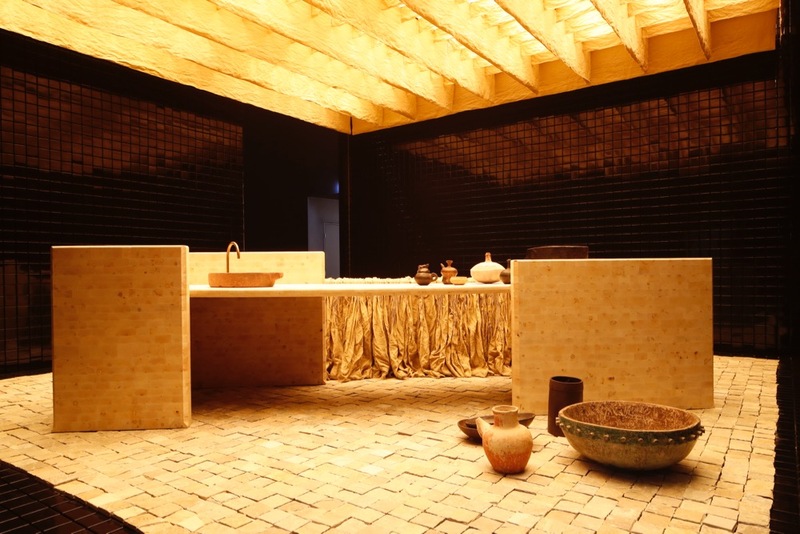 Their installation for the Rigg Prize 2018 was gob smackingly simple in some respects but the conceptual kitchen's near biblical look was countered by thousands of glossy square tiles with a flash of blue neon occurring intermittently in the corners. If it wasn’t for the electric blue light Design daily could have happily sat and looked at this restful tableau for a very long time. Moving around to the installation’s other aperture - a smaller opening on a side wall - the bedroom was revealed in all its ruched glory. Oh and did we mention the ceiling beams are also covered in linen and the floor is set out with rough stones to form a type of stone-age carpet? The bedroom wing of the Richards and Stanisich installation. Note the linen covered beams. In contrast to the work of Richards Stanisich, the installation created by Danielle Brustman was a glamorous hybrid of American roller skating rinks and dinners, 70’s discothéque and futuristic sci-fi films. Brustman loves a particular style of colour that might be described as ‘subtle’, ‘sophisticated’ or on occasions ‘dirty’. 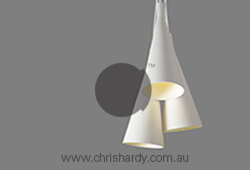 She avoids obvious colour and loves dramatic shapes such as circles, stars and even the odd lighting bolt. 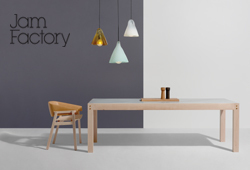 After studying interior design at RMIT, Brustman set up a studio from 2013 - 2016 with Michelle Boyde called Brustman + Boyde and since 2016 has run her own eponymously named studio. Danielle Burstman’s installation. Exuding what some might refer to as futuristic retro, the installation played with curvilinear shapes, soft colours & reflective surfaces. Amber Rose (sisters Yasmine Ghoniem and Katy Svalbe) are another young studio that has garnered more than its fair share of design awards and nominations including the 2017 Rado Design Star Award presented by the Belle Coco Republic Interior Design Awards. The pair’s dreamy, otherworldly installation for the Rigg Design Prize 2018 used only two freestanding pieces of furniture. Soft fabric walls and overlapping rugs created an open tent-like space that seems to talk of the future while referencing many ideas of ancient nomadic tribes. Amber Road’s warm interior feels like living on a new planet where the exterior environment is reflected inside. Everything seems to hover and walls appear to be projected rather than physical. Sydney interior designer, stylist and shop keeper, Sibella Court of The Society Inc is one of the most in-demand hospitality designers of recent years, working her multi-cultural magic on numerous restaurants in Sydney but she is also a residential designer worthy of attention - bringing her mix of found objects, history and old-world craft to interiors that go beyond the here and now. She is also an author of several books on her approach to interiors and it is the combination of all of these things that informs her installation for the Rigg Prize 2018. Like a Phileas Fogg balloon journey, the installation encapsulates the culture and the art of numerous countries and eras in one glorious go. Creating a steel framed ticket booth-style structure as an adjunct to her stand was a brilliant idea and broke the feeling of a prescribed stage that dominated the work of the rest of the designers. For some it was a little out of control, a little all encompassing but its what Sibella Court seems to enjoy - the head on collision of history, art and everyday objects. The Society Inc for Sibella Court. This home for a global bowerbird was a favourite for many as it mixed influences as disparate as pirates, Japanese craft, sailors knots and antique metalwork. 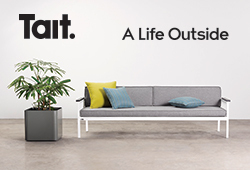 Scott Weston, the founder of Scott Weston Architecture and Design is famous for his obsession with bright colour. For his Rigg Prize 2018 installation he turned this on its head and created six monochrome room sets where the only only colour and only (well almost) 3-D element was to be found in the six long-legged cabinets that housed Weston’s favourite personal objects. These modern day cabinets of curiosity combined a single object captured behind glass while an open drawer revealed smaller pieces of life and art. Like a spatial exercise with a strong Fornasetti influence, the installation displayed the designer’s favourite and very real domestic objects on what appeared to be photo copied shelves while real mantelpieces projected from flat 2-D reproductions of architectural details like skirting boards and floors. The overall effect was hugely photogenic. The installation of Scott Weston Architecture and Design. 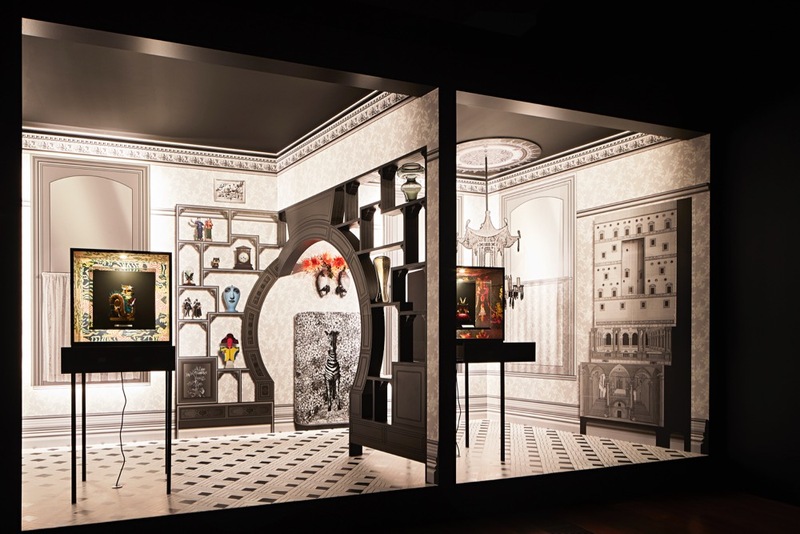 Six contemporary expressions of the cabinet of curiosity provided 3-D fascination against 2-D room treatments created specially for the competition. Only two are shown here with three rooms sets positioned back to back. Sydney’s Arent & Pyke, headed up by founders Juliette Arent & Sarah Jane Pyke, created a highly measured environment where art was the focal point that informed each of the three domestic zones: Eating, Bathing and Sleeping. An antique tapestry serves this function in the bathing area, while a similar focus is apparent in the hand-painted burl wood dining table that appeared from a distance to have been executed in stone marquetry. The sleeping area has its own art piece in the form of a group of red and white striped totems. The extreme mix of eras and the simplicity of the concept allowed objects to form their own bonds. 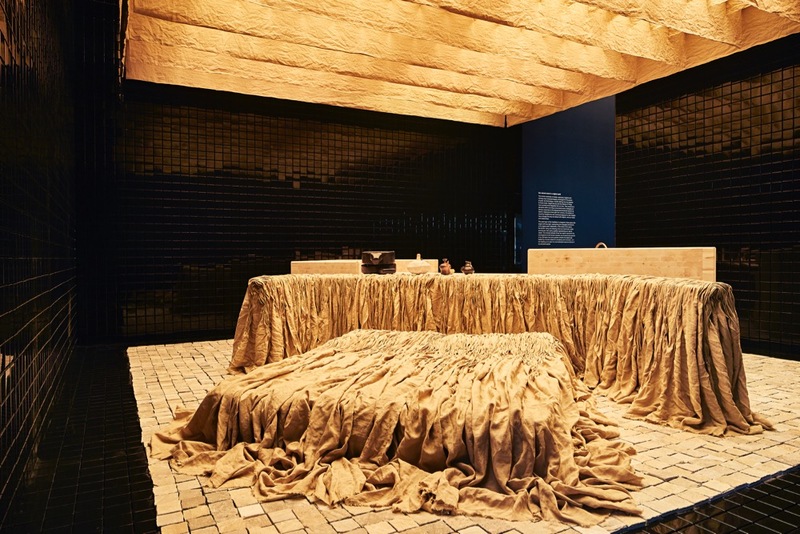 The Arent & Pyke installation featuring a antique tapestry, monolithic stone washbasins and an enormous yellow curtain dividing the eating, bathing and sleeping zones. It’s hard to put your finger on what Flack Studio’s installation is channeling - there is just so much crammed into this ode to yellow that the mind is prone to visual overload. Once the initial ‘OMG’ has escaped one’s lips, the scene begins to calm down and a proper investigation of the objects is extremely rewarding, turning up a delightful mix of textures - brushed metals on the blocky armchairs and whatever that fabric on the more traditional lounge chairs is called for example! To call it maximalist would be wrong as there is a total adherence to a color concept - a maximalist would never do that when there are a so many colours to choose from! 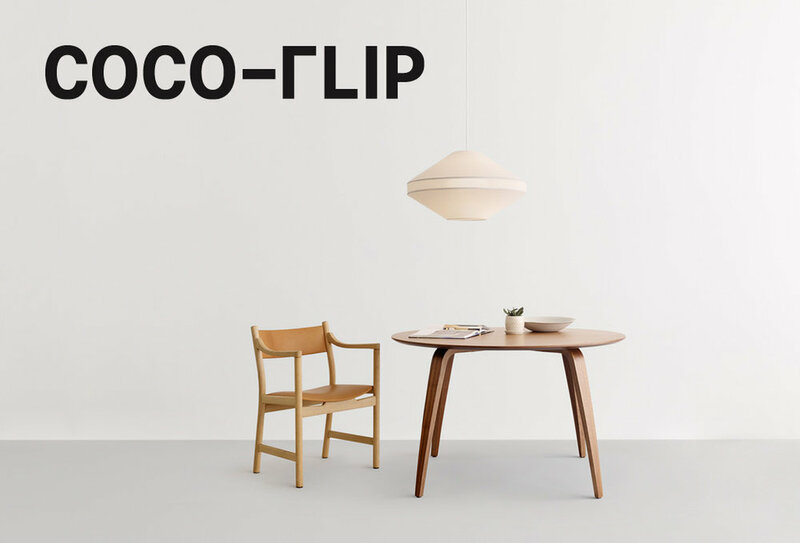 Flack Studio was founded just a few short years ago but has gathered a mass of awards for its courageous approach to interior design. It seems they are determined to drag Australia out of its dull interior past into something far more complex and exciting - whether we like it or not - and in most instances we definitely do. Flack Studio’s extravaganza in YELLOW! Melbourne designer David Hicks is well known for luxury interiors for the well-to-do but in his installation for the Rigg Prize 2018 he pushes this work into new, slightly sinister territory with a look at what rooms of the future might look like. Surveillance screens and a bunker-like vibe permeates his Panic Room space. The light from these monitors catches on the glamorous crystal laden chandelier. The room is certainly beautiful in its own way but definitely not an easy concept to swoon over. David Hick’s Panic Room. 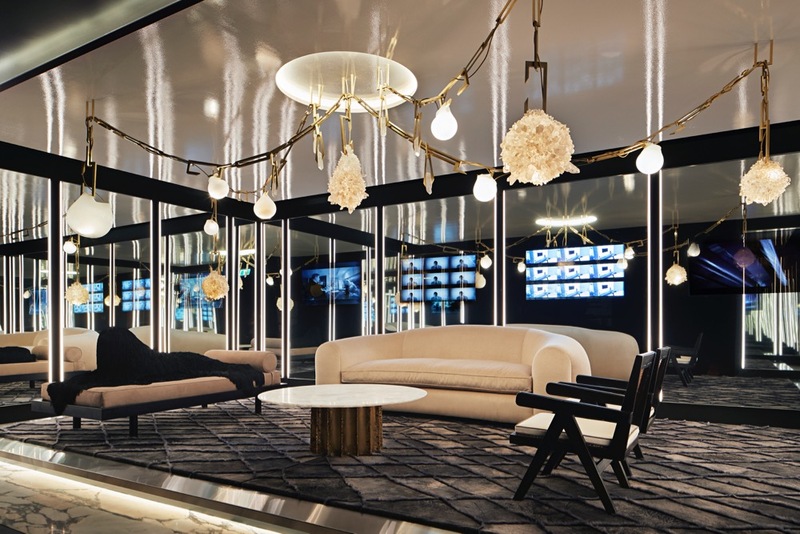 Complete with multi-screens and a knockout chandelier, many people wouldn’t want to leave. Its highly reflective surfaces however, create an eerie feeling where day and night are blurred and sinister events seem to be ever present in the outside world. And yes, that is a strange creature on the daybed! Established in 1994, the Rigg Prize is supported by the Cicely & Colin Rigg Bequest, managed by Equity Trustees. The prize is a legacy of the late Colin Rigg (1895–1982), a former Secretary of the NGV’s Felton Bequests’ Committee. Previous winners of the award have included Neville Assad (1994), Robert Baines (1997), Louise Weaver (2003), Sally Marsland (2006), Simone LeAmon (2009) and Marian Hosking (2012). The exhibition at the Ian Potter Centre: NGV Australia, Federation Square, Melbourne, runs until February 24, 2019. Entry is FREE. For information take a look at the NGV website here.